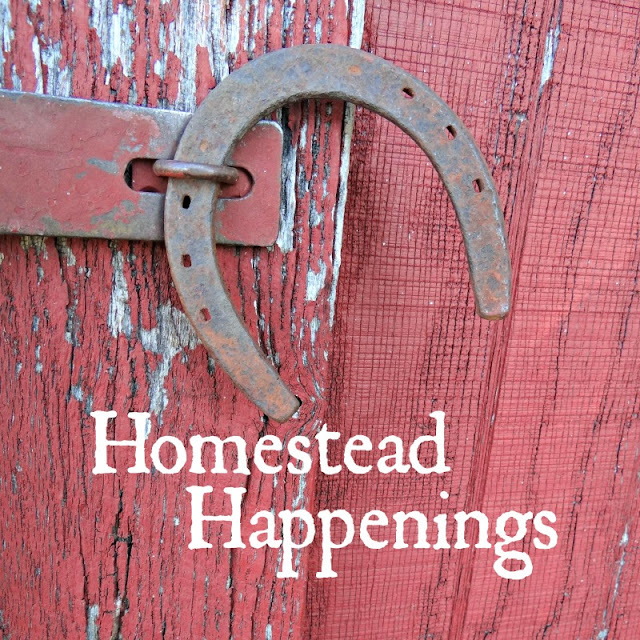 Welcome to Volume 5 of the Homestead Happenings, a sort-of-monthly peek into what's going on behind the blog. Spring has sprung and the garden - some of it anyway - has sprouted. The garlic looks great, my comfrey plants are all up and growing, and the perennial walking onions have walked out of their washtub container and some are growing in the lawn. I even noticed one growing by the rosebushes. Those need to be transplanted into the garden. In the fall I took all of my container-grown herbs inside for the winter and every one of them died. I'm not pointing fingers, but I probably should have watered them more often. I've replaced the rosemary plant and the thyme, and this time I planted them in a raised bed that I'm planning will be my herb bed. Hopefully the perennials will survive the winter in the ground better than they have in pots. Cabbage is growing and red onion sets are sprouting. 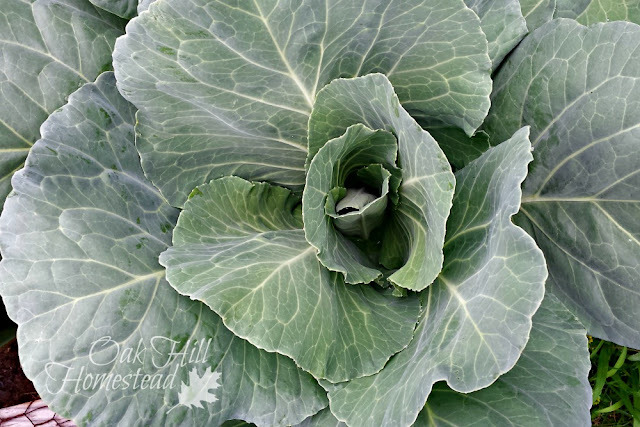 I'm growing a different variety of cabbage this year. I want round heads, not the elongated ones I had last year with the early Jersey Wakefield variety I planted. I've also planted Yukon Gold potatoes but there's no sign of life yet. I've never been successful with potatoes but I'm trying again anyway. I was unable to plant seeds indoors this year as I was away from home for a week and they wouldn't be watered, so I bought tomato and pepper transplants that are happily living outdoors now and are ready to be planted. I will plant seeds directly in the ground for the rest of the garden when it's time, which will be SOON! Poor Papa looks awfully muddy - we'd had a lot of rain. 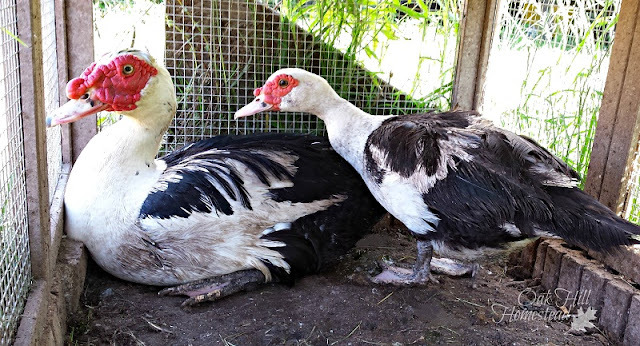 Two of the three Muscovy duck hens are setting on eggs. The oldest hen, Mama Duck, is not setting. She and Sharon were both laying in the same nest, just like chickens do, and Sharon began setting first. I'm not sure if there was an argument about who got custody of the eggs or not. I think not since Mama is the dominant hen; maybe she just wanted to take a rest this spring. There were 35 eggs in their shared nest the last time I checked. I removed a dozen before Sharon began setting in earnest, because there was no way she would be able to keep that many eggs warm. Cora, the chocolate and white duck, began setting while I was out of town so I'm not sure how many are in her nest - there were 19 when I cleaned the coop before I left town. She is the youngest of the three hens but she's very devoted to her eggs and poor Frank, her mate, is pretty lonely. Evidently he's been banned from the nest area. The horses' pasture is greening up, and instead of waiting for me at the gate each morning they are now searching out green tidbits. Next week I'll shut the hayfield gate and begin growing next winter's feed. Splash has lost a bit of weight this winter so I'll have his teeth checked; they probably need to be floated. We don't really know how old Splash is. When we got him eight or so years ago, the vet estimated his age at 17-18. I asked the farrier for his best guess last summer, and his estimate was 17 or 18 years old. My guess is that he's over 20 but I haven't checked his teeth and wouldn't know how to anyway. It's sad that we're all getting old. March 18th was National Quilting Day, and I started two baby quilts. Those babies have both already made their entrance into this world - in fact, one of them is two years old. 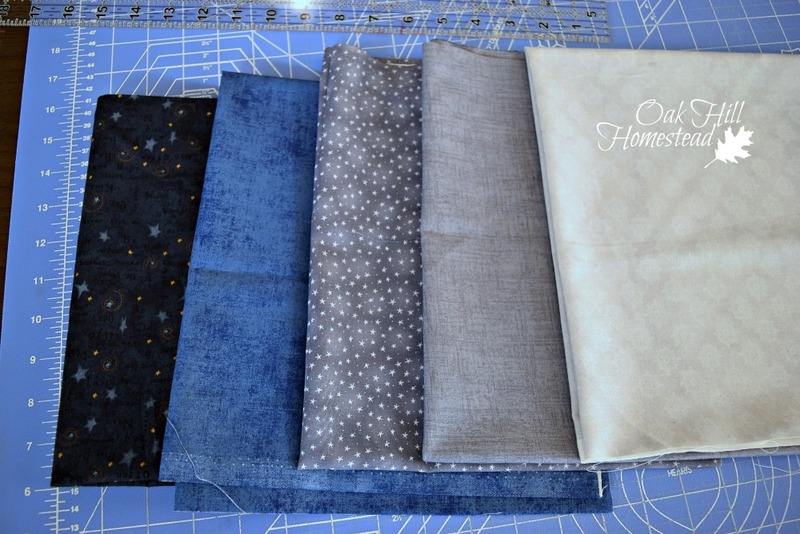 I love to quilt, but my fingers and my eyesight are both a bit more uncooperative these days so I'd put off these projects. Now that there is another grandbaby on the way, I'm behind by three quilts. If I don't get to work on them now, it will be impossible to catch up. The patchwork on both is finished and they are ready to be sandwiched with the batting and backing and then basted together for quilting. I'll wait to start the third quilt until we know the baby's gender. It's been a windy and dry spring in Oklahoma this year and the fire danger has been very high. We've had several fires to the south and to the west. The last one was about a mile and a half south of us and the wild wind was blowing right in our direction. That one had us concerned until it was out. I've cleaned, filled and hung up the hummingbird feeders in anticipation of their spring migration. I'm hoping for as many as we had in the fall. They are such fun to watch. Found your post at the Homestead Blog Hop, thanks for sharing! Thank you for hopping over to visit, Andrea; I hope you'll be back again soon. 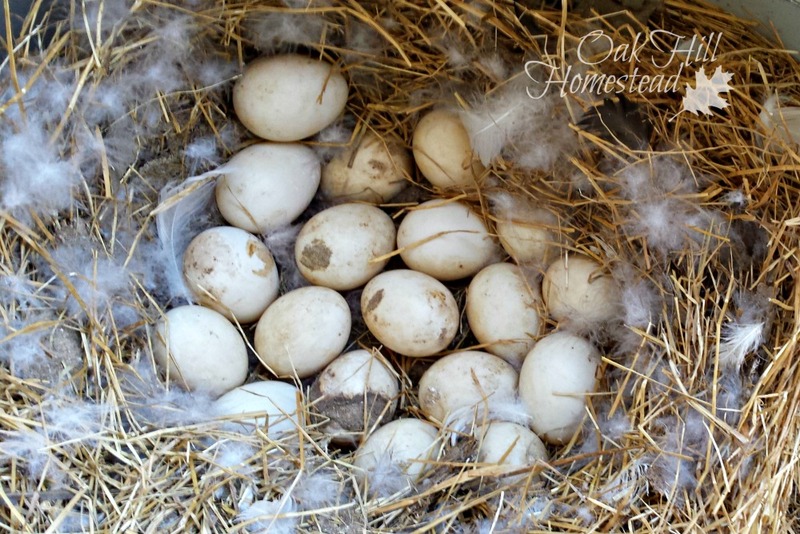 It's nice to see your account of your time on your homestead... so much going on. :) Thank you for sharing this with us... by the way, I, for one, would love to see pictures of your quilts if you ever want to share them! Oh I hope some of the eggs hatch - what fun! I too have been struggling with my eyes, I see better without glass now - close up. My horses aren't waiting for me either. I had to close the gate to the pasture to let it green up a bit before letting them out for the spring/summer days. Have a good week. Baby ducks are the cutest, aren't they? Even cuter than chicks, I think. I hope you have a great week too, Dicky Bird. How lovely that you are making quilts for your grandchildren! There's nothing like a handmade quilt, full of love and memories! I really enjoyed reading this post, and you've linked to so many helpful posts within it, Kathi. It's a great resource and I'm sharing it on our Hearth and Soul Facebook page. Thank you so much for being a part of Hearth and Soul. Thank you so much, April, I'm glad you enjoyed it. I appreciate your sharing the post too. I can't wait for the hummingbirds to come back here; last year I had 8 of them humming around the yard all summer. I only had hummers in the fall - you were so lucky to have them all summer long! I'll come visit in a bit.